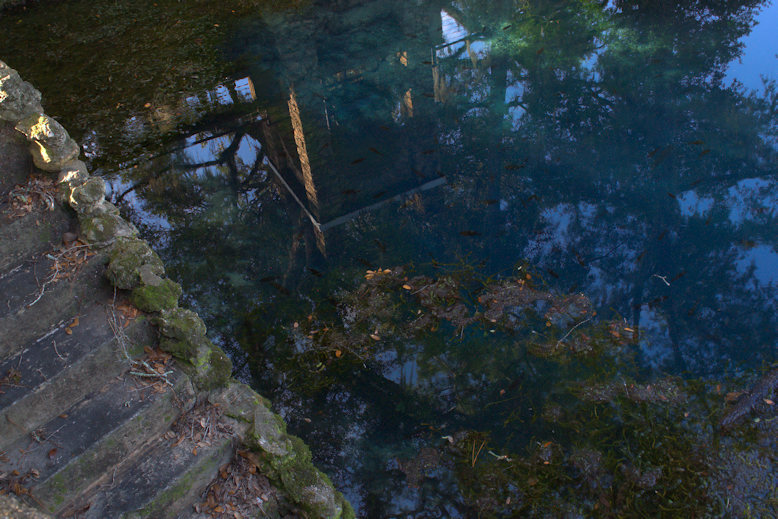 70,000 gallons of water issue from the underground caves at Radium Springs every minute, making it the largest springs in the state. It’s considered one of the Seven Natural Wonders of Georgia and is located just outside Albany. Over a quarter mile of the underground caves encompassing the springs were mapped by Deloach, Young, and Exley, for the National Speleological Society. Features of the caves have names like Fat Man’s Misery, Mermaid’s Tunnel, Hall of Giants, and Neptune’s Trident. Only the most experienced divers have ever seen these wonders and though rare, permits are occasionally still issued to experts wishing to explore the area. Guy Bryant has shared some nice footage on YouTube. It was a revered ceremonial site first known as Skywater to Native Americans. 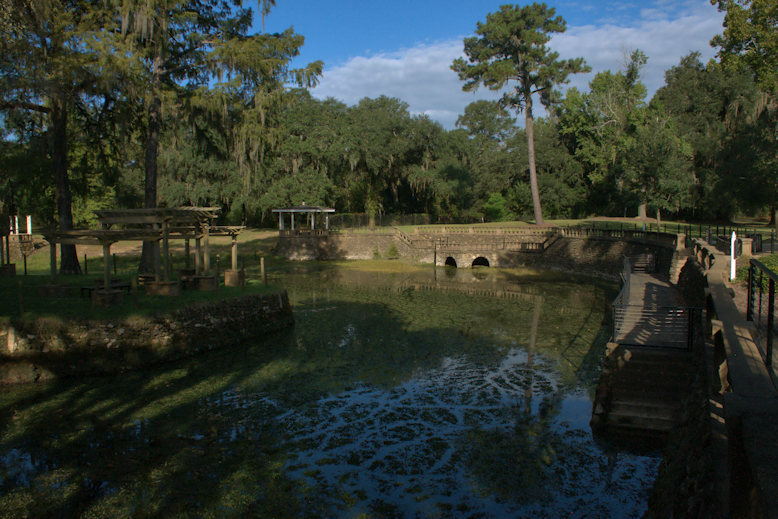 After encroachment in the 1830s it came to be known as Blue Springs and was a popular swimming hole with pioneer settlers of Albany and surrounding areas. Standing near the cave entrance/springhead today, one is likely to see numerous fish schooling, including Gulf striped bass which wouldn’t be here without the cool temperature of the springs. By the early 20th century, its prominence as a commercial recreational site was ensured and developers constructed a restaurant and guest cottages to meet the needs of day trippers who enjoyed bathing in its waters, which were a constant 68 degrees. 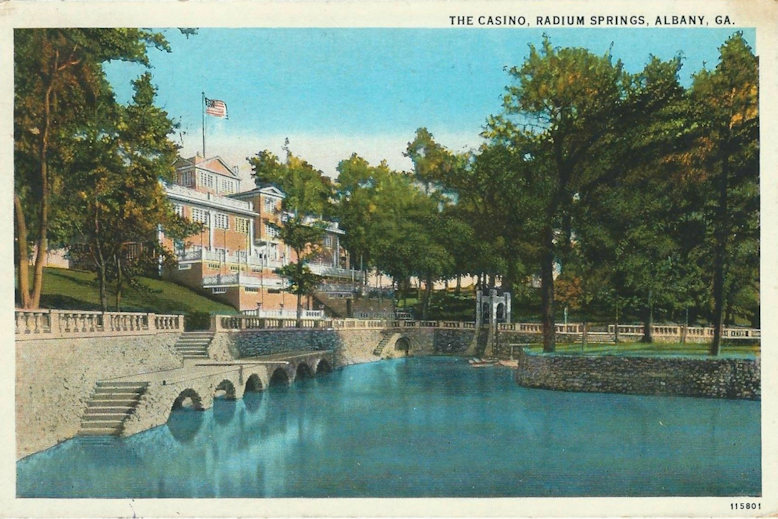 Traces of radium were found in the water in the 1920s and the name was changed to Radium Springs to reflect this discovery. 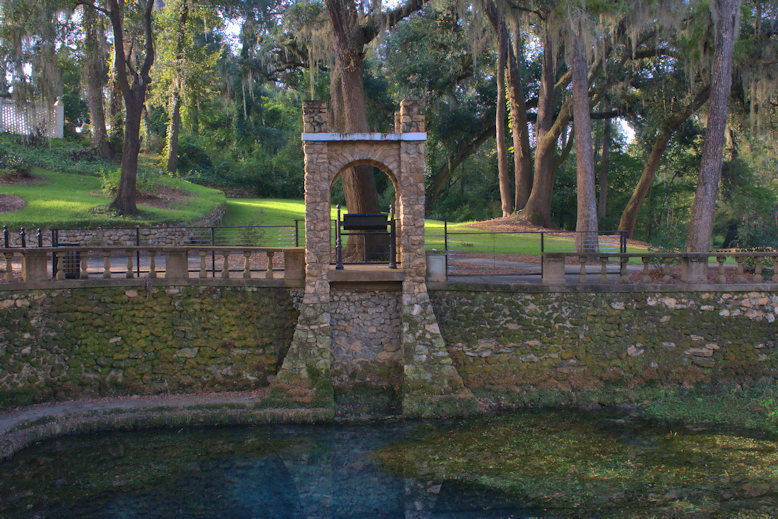 Mineral springs were all the rage in the era as they were thought to have healing powers and this only added to the popularity of the site. 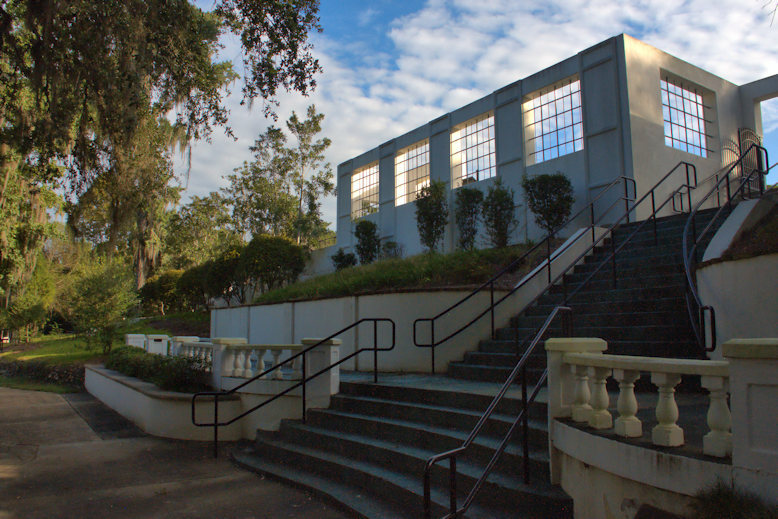 The Radium Springs Casino was completed in 1927. It rose above terraced stone walls and featured a cavernous dance hall and elegant dining room. A fire in 1982 and devastating floods in 1994 and 1998 damaged the casino beyond repair. The remaining structure was removed in 2003. 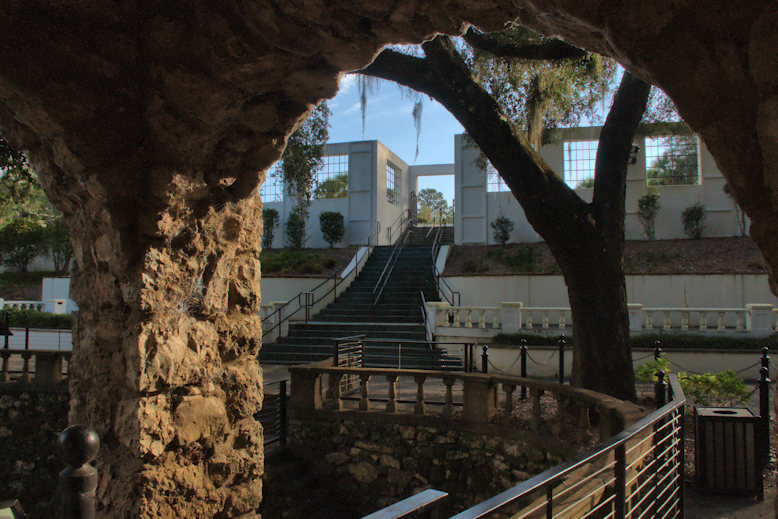 A courtyard stands today on the site of the casino and features interpretive signs detailing the history of Radium Springs. 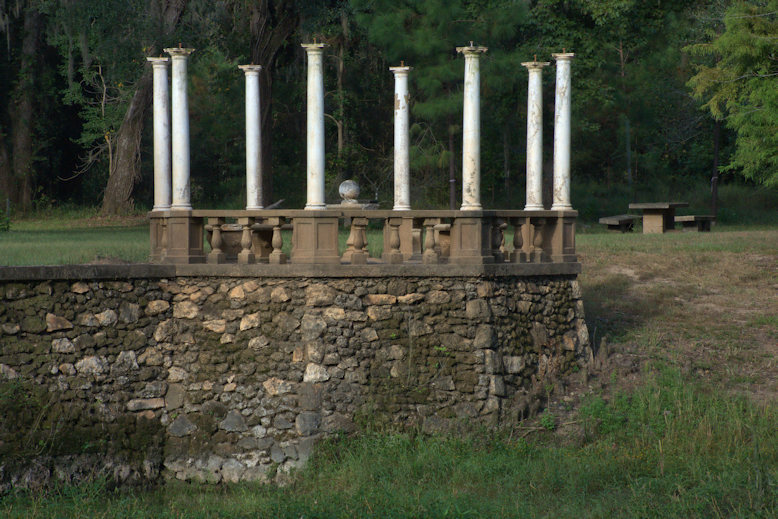 The stonework surrounding the springs and pool is one of the most significant remaining architectural features of the site. 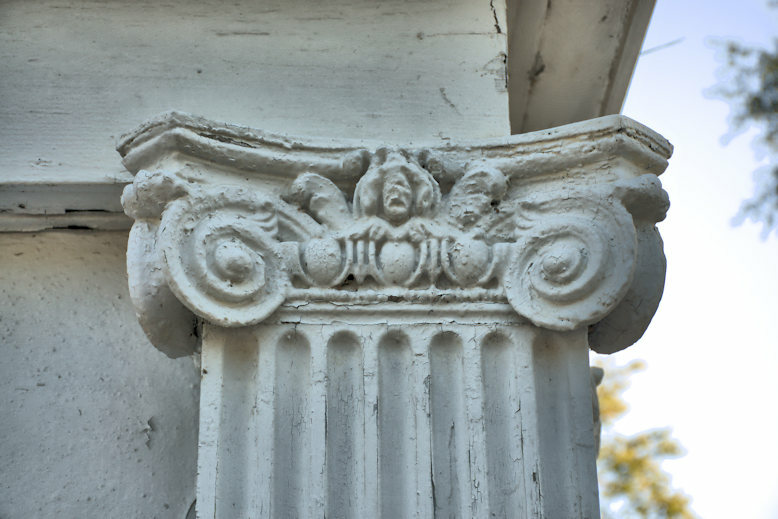 These features are generally not accessible today, though, as they are beginning to crumble and in serious need of restoration. This is one of two gazebos that were located along the beach. 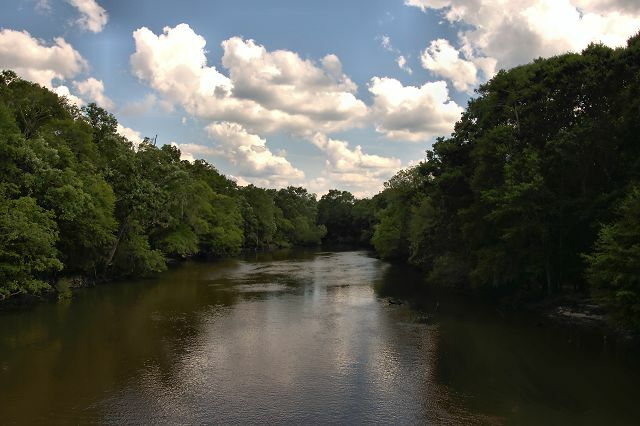 The spring run which empties into the Flint River is known as Skywater Creek. 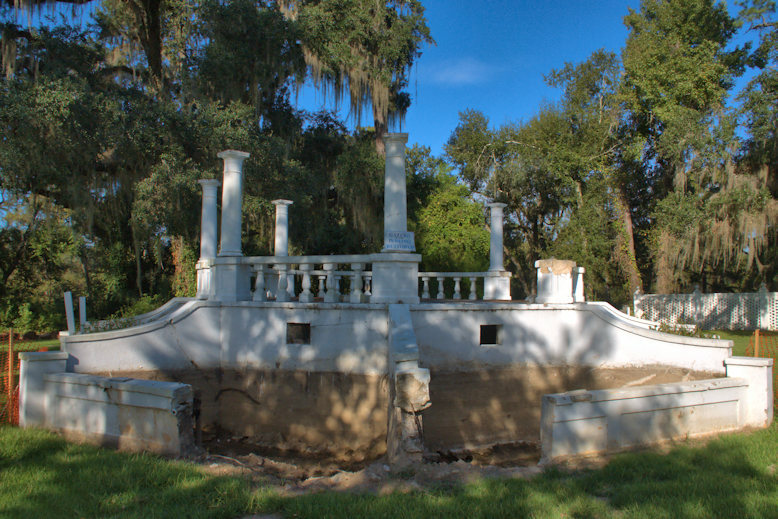 The ruins of the main gazebo are being restored. They’re located just inside the historic gate. Both structures date to the 1920s, when the casino was constructed. 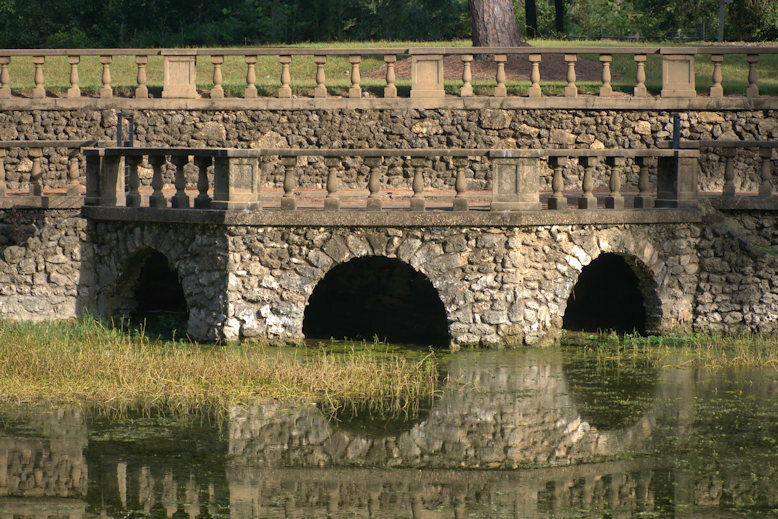 At the peak of the site’s popularity, a nearby golf course was equally popular as the springs and attracted notables, including the great golfer Bobby Jones. 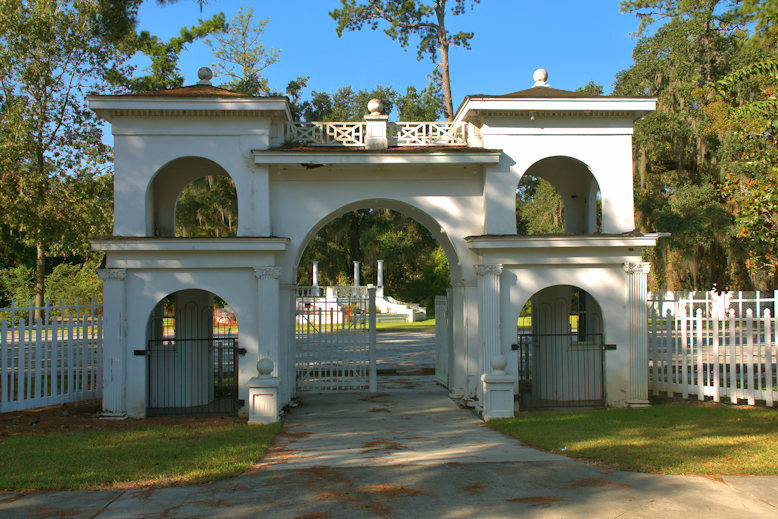 The entrance gate is a monumental Colonial Revival landmark. It features two ticket booths. 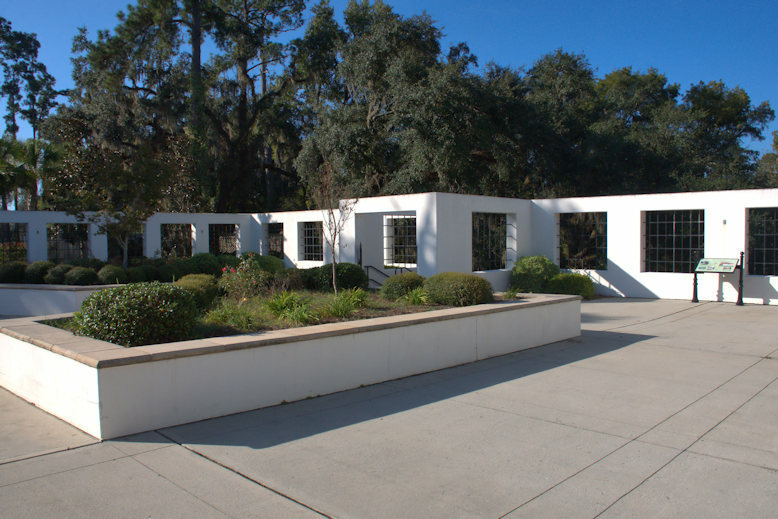 Known today as Radium Springs Gardens, it’s operated by the City of Albany and admission is free. It’s a wonderful green space that everyone should see at least once. Though swimming or fishing is no longer allowed, it’s a wonderful place to unwind. 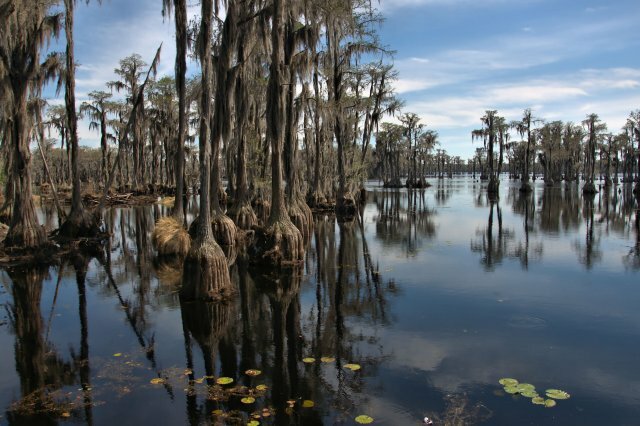 At just 20 miles in length and a mile wide at its widest, Lake Blackshear is one of Georgia’s smallest man-made reservoirs. 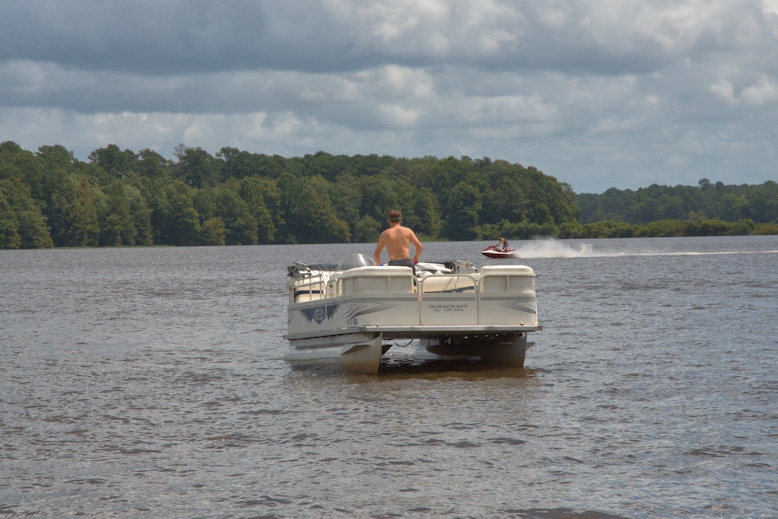 It’s essentially a wide spot on the Flint River but it’s among the most popular outdoor recreation areas in South Georgia. To my knowledge, it’s also the oldest major man-made lake in Georgia, created with the damming of the Flint River between 1925-1930. 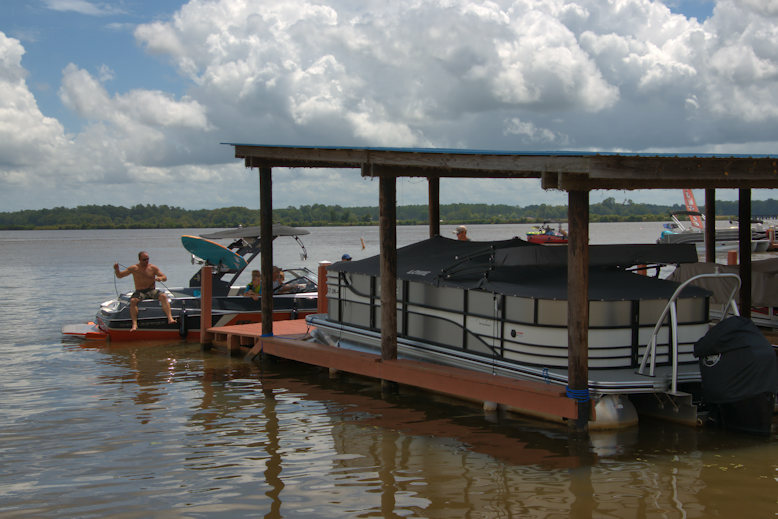 Pleasure boating and water skiing are extremely popular, as is fishing. There’s a busy put-in at Lakeshore Marine on the Sumter County side. 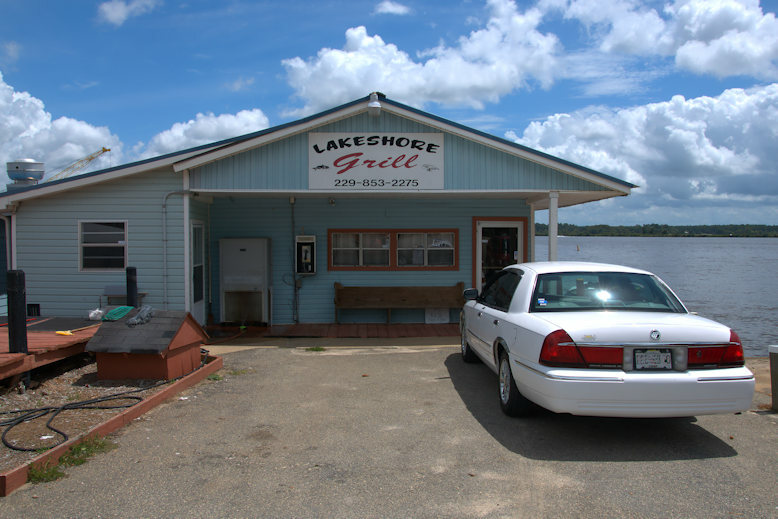 Besides a ski shop, marina, campground, and event space, there’s the Lakeshore Grill which sells food, tackle, coolers, beer, gas and other essentials. Georgia Veterans State Park is a mile or so from here and is the primary location for public access to the lake. If you’re in the area, stop at Stripling’s for some of the best sausage around. 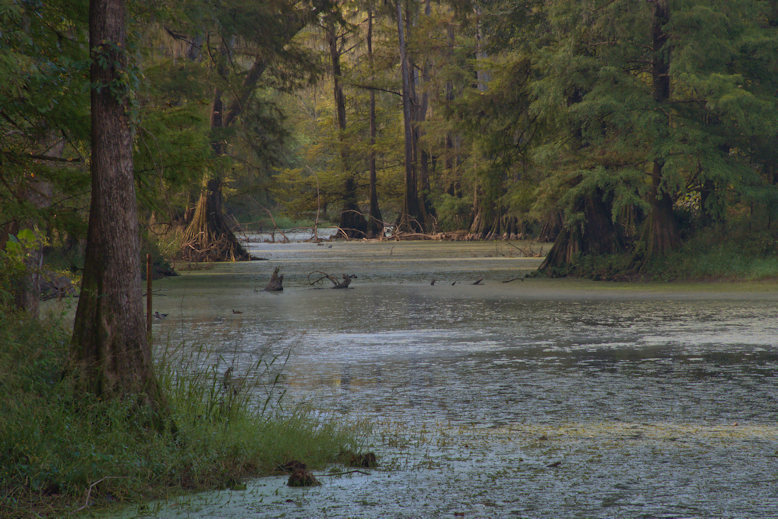 Georgia’s southernmost town, St. George, is located within the “Georgia Bend” of the St. Marys River. 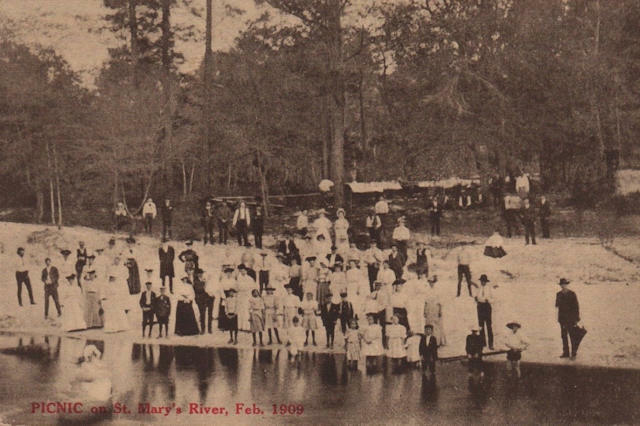 This historic postcard, mailed from St. George, illustrates a picnic held along the river in February 1909. I have no idea what occasion warranted such a photograph. It must have been a really mild winter, though, as a few of the boys are standing in the river. 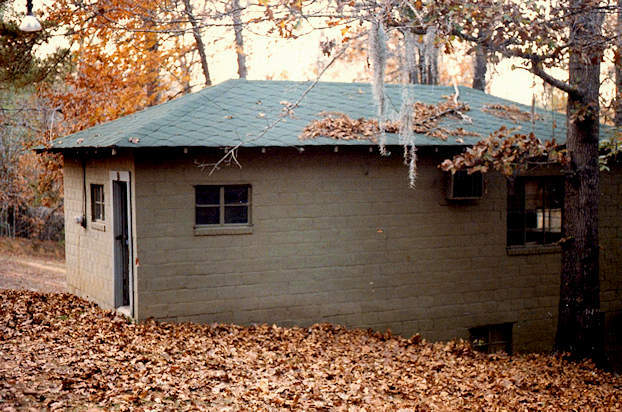 Jan Stokes notes that Charlie Newcomer, Sr., built this hunting cabin on Spring Lake Creek in the early 1940s and it’s still in use today. Spring Lake Creek is a tributary of the Ocmulgee River near the Wilcox-Ben Hill County line and is fed by one of several springs in the area. I spent many holidays here in my youth swimming and exploring the surrounding woods. The spring-fed water was so cold that we cooled our watermelons in it. I made this photo in 1986. 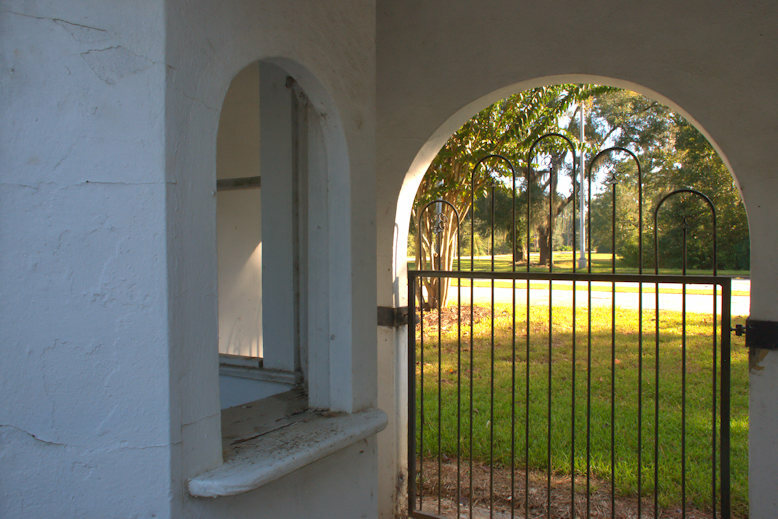 Oliver Landing is a great place to access the Ogeechee. 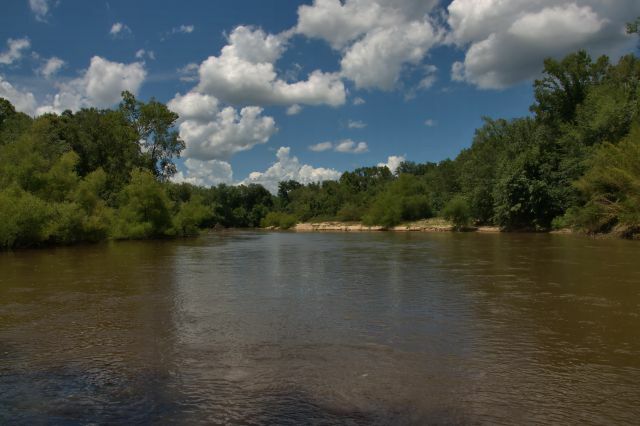 A great place to access the beautiful Flint River is the George Hooks Landing just west of Montezuma. 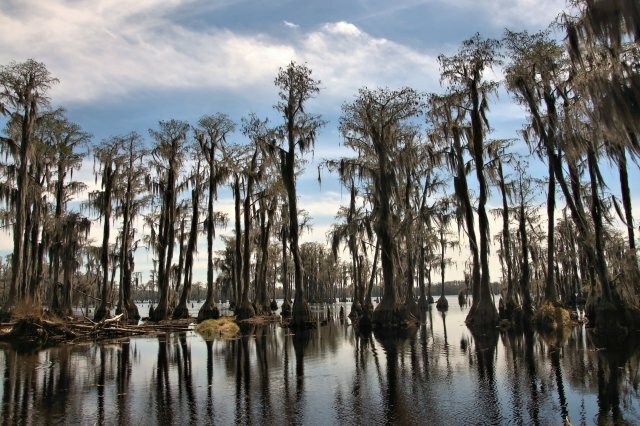 Banks Lake is a natural blackwater lake characterized by shallow water and cypress trees. 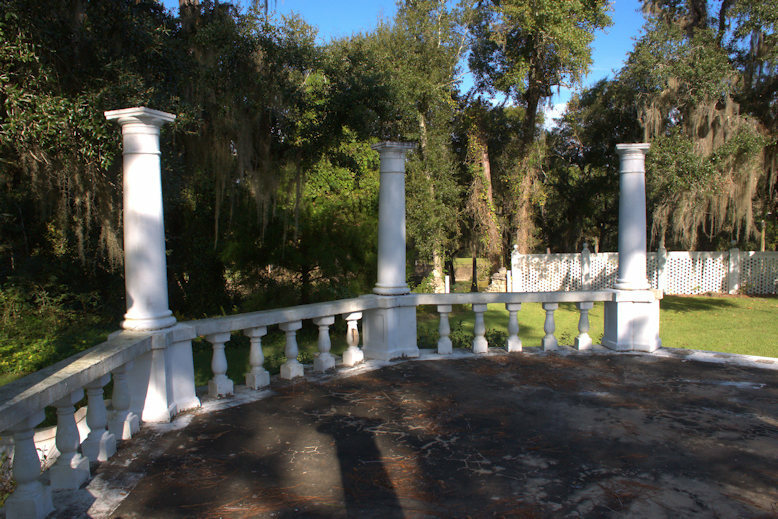 Located just east of Lakeland, it was owned for much of the 2oth century by the family of Governor Ed Rivers. Joshua Lee operated a grist mill here in the mid-1800s. 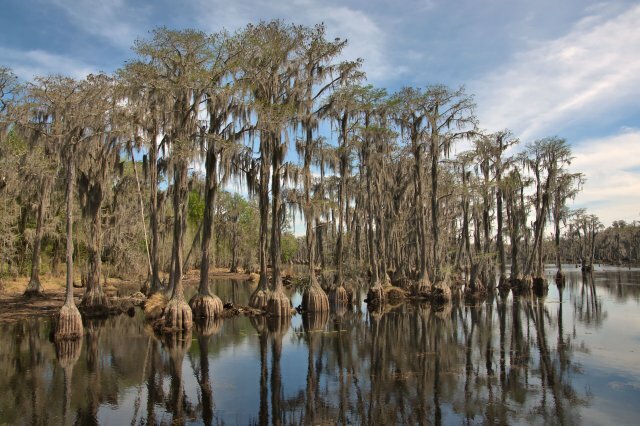 When he dammed the Carolina bay on his property, the lake was created. 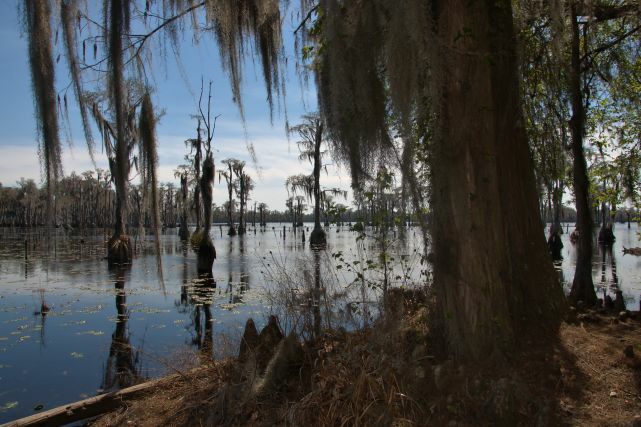 Unsubstantiated sources suggest that Governor Ed Rivers’ family attempted to develop the area in the 1920s and that his estate threatened to drain and log the lake in the 1970s, but regardless, the property was purchased by the Nature Conservancy in 1980, assuring its preservation. In 1985, the Conservancy sold the lake to the U. S. Fish & Wildlife Service, who redesignated it Banks Lake National Wildlife Refuge. With around 20,000 visitors per year, Banks Lake National Wildlife Refuge is one of the least crowded parks in the system. It almost feels like a roadside park because, effectively, it is. There are docks and a short boardwalk and an outfitter on site. A gentleman I met on the dock told me that fishermen tie strips of cloth to trees to find their way around. It’s apparently quite thick with cypress. 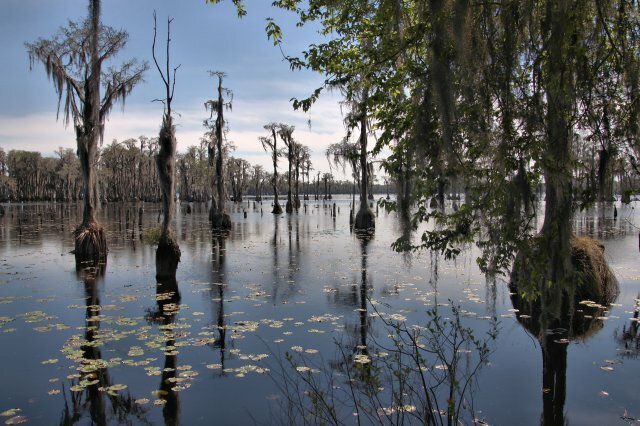 Banks Lake is part of the Grand Bay-Banks Lake ecosystem, the second largest freshwater wetland in Georgia, after the Okefenokee Swamp. 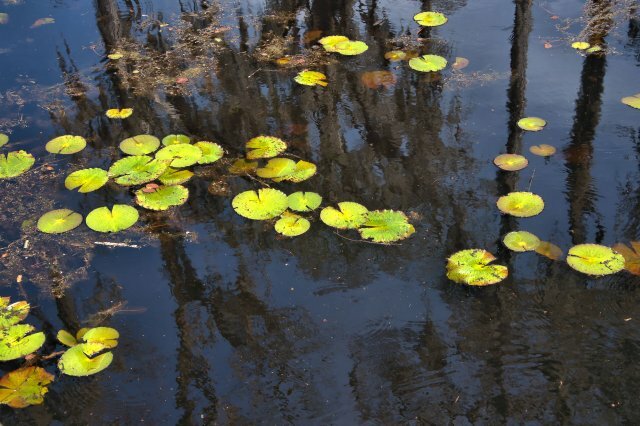 The refuge, managed by the Okefenokee National Wildlife Refuge, does not have on-site staff. Fishing is allowed, for those with valid licenses. 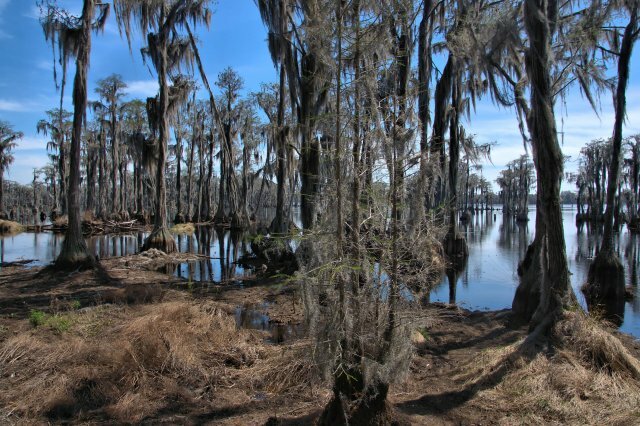 For information on this natural wonder of Georgia, please visit the refuge website.